of tapestry have remained constant. 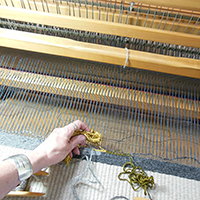 My tapestries are woven with natural materials, including wool, silk, linen, mohair, and cotton. Each fiber has its own unique properties and reflects light in a different way. Most of the yarns are either the natural color of the fiber or they have been hand dyed to the exact colors needed for each tapestry. I use Lanaset or Procion MX dyes with a variety of dye techniques. Many of the tapestries also include embroidery. These tapestries are woven on a Gilmore loom.